WASHINGTON, November 14, 2018 /3BL Media/ - The U.S. Department of State, U.S. Embassies, Partners of the Americas, and NAFSA: Association of International Educators announce new grant recipients in the latest 100,000 Strong in the Americas Innovation Fund Competition. These Innovation Fund grant-winning teams of higher education institutions will provide access to short-term exchange and training opportunities in the United States and Latin America to students who traditionally lack the resources or are underrepresented in international mobility programs. Specifically, these Innovation Fund grants, with generous support from MetLife Foundation, will facilitate nine partnerships between universities and colleges in the United States with higher education institutions in Argentina, Brazil, Chile, Colombia and Mexico. This second MetLife Foundation-sponsored Innovation Fund grant competition will support nine teams of eighteen higher education institutions in the United States, Argentina, Brazil, Chile, Colombia, and Mexico to implement new academic exchange programs that provide students with unique opportunities to work in teams, conduct research, and solve real-world problems in an international setting. These Innovation Fund grant programs at universities and colleges in the United States and five countries in Latin America will provide training opportunities to students from diverse academic disciplines, such as Chemistry, Education, Engineering, Health Sciences, Nutrition, and Migration Studies. Since January 2014, the Innovation Fund has awarded 187 grants to nearly 350 teams of higher education institutions from 25 countries and 42 U.S. states. Innovation Fund grant awards are typically $25,000 each—with grant-winning teams contributing other resources an average of 1.8 times above the grant award—to implement new and sustainable academic exchange programs for students in the United States and the rest of the Western Hemisphere. The announcement of these new Innovation Fund grant-winning higher education institutions, sponsored by MetLife Foundation, takes place during International Education Week (IEW) in November 2018. IEW is a joint initiative between the U.S. Department of State, U.S. Embassies, the U.S. Department of Education, NGOs, higher education institutions, and other entities working to promote and recognize the benefits of international education and academic exchanges worldwide. Boise State University and Escuela Colombiana de Ingeniería Julio Garavito are partnering to design a bilateral exchange to overcome barriers to study abroad in the field of engineering. The program aims to expand the study abroad capacity at Boise State and La Escuela’s research capacity and students’ readiness for advanced studies in the United States by developing a short-term, faculty-led program that will provide global learning opportunities to economically-disadvantaged, female engineering students and students of minority ethnic backgrounds. Cornell University, along with Universidad del Magdalena, will implement a bilateral, student exchange program that will prioritize minority students who otherwise may not have the opportunity for global learning. The program aims to improve students’ skills in teaching and research and enhancing their vision of future directions and goals in STEM-related work. Georgia Southern University (GSU) and Universidade de Brasilia (UnB) are collaborating to create a new, bilateral study abroad experience that will provide students with innovative, hands-on and experiential learning activities and enable them to reflect on their new cultural and technical knowledge in the fields of political science, sociology, and chemistry. GSU students will participate in a series of summer courses at UnB to learn about sustainable technology practices and federal policies in Brazil, while UnB students will take courses at GSU to engage in all aspects of scientific research and training techniques. Grand Valley State University (GVSU), in partnership with Universidad del Bio-Bio (UBB), is embarking on a bilateral exchange program to increase north-south mobility and to build intercultural competence in under-represented student populations at both institutions. The CAMINO program seeks to reach students of color and those with high financial need at GSVU and students from the most under-resourced groups at UBB. Johnson & Wales University, Universidad de Congreso, and Regis College will develop a new, exchange program designed to address global health concerns. Through experiential and service-oriented community engagement activities, cultural experiences, industry-led trainings and faculty-led lectures in the U.S. and Argentina, students will explore the regional impact and issues surrounding health and nutrition that affect local populations, such as food availability, preparation, sanitation, and security. In a new partnership, Northern Virginia Community College (NOVA) and the Instituto Federal do Acre (IFAC) will create a program to address the lack of financial resources for students to pursue international opportunities. At NOVA, the program will target first-generation, Pell-grant recipients, and those who are part of the college’s Pathways to the Baccalaureate program. In Brazil, it will focus on indigenous students from families predominately in the farming and fishing industries in the rural areas surrounding IFAC and give them access to international exchange opportunities. Universidad Alberto Hurtado and Texas State University will create a new credit-bearing, study abroad course for English as a Second Language, undergraduate students. The program will engage students in cross-cultural exploration, learning, and projects related to issues of migration, inclusion, and diversity in K-12 schools and local communities in Texas and Chile. Universidad de Aysén (UAYSEN) seeks to improve its capacity for future study abroad and strengthen its relations with Regis College through its first northbound study abroad program. UAYSEN health sciences students, the majority of whom come from rural regions in Chile and have never left the country, will travel to the United States to learn about the social factors that impact public health issues and analyze the differences in healthcare solutions between the two countries. Universidad La Salle Oaxaca and Virginia Commonwealth University will develop a joint, multidisciplinary program centered on the impacts of transnational migration on the host communities. Students, including indigenous students from Oaxaca, Mexico and economically-disadvantaged students from Richmond, Virginia, will enroll in courses, receive language instruction, and participate in service-learning opportunities that will allow them to help serve the needs of indigenous communities in Oaxaca and of refugees and immigrants in Richmond. 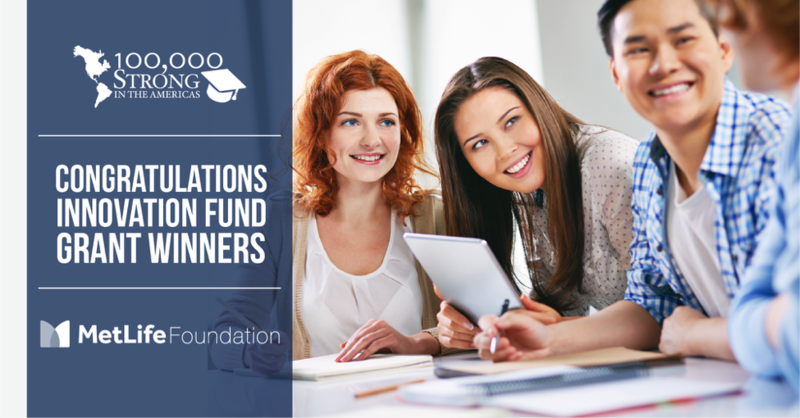 Learn more about these Innovation Fund grant-winning institutions and their projects here. Since its inception in January 2014, the Innovation Fund has awarded 187 grants to 350 teams of universities and colleges in 25 countries and in 42 U.S. states. Currently, over 1,800 higher education institutions have joined the Innovation Network— with 1,000 universities and colleges in the United States. The mission of Partners of the Americas is to connect people and organizations across borders to serve and to change lives through lasting partnerships. These partnerships create opportunity, foster understanding, and solve real-life problems. Inspired by President Kennedy and founded in 1964, under the Alliance for Progress, Partners is a non-profit, non-partisan organization with international offices in Washington, DC. Learn more at www.partners.net or via Twitter @partnersamerica. MetLife Foundation was created in 1976 to continue MetLife’s long tradition of corporate contributions and community involvement. Since its founding through the end of 2017, MetLife Foundation has provided more than $783 million in grants and $70 million in program-related investments to organizations addressing issues that have a positive impact in their communities. In 2013, the Foundation committed $200 million to financial inclusion, and our work to date has reached more than 6 million low-income individuals in 42 countries. To learn more about MetLife Foundation, visit www.metlife.org.